We ship furniture that's boxed or unboxed, we ship furniture that's brand new, and we ship furniture that's been in the family for generations. 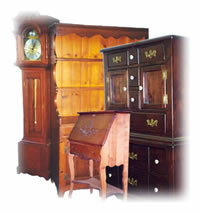 We ship antiques, items sold on eBay, you name it - if you need to ship furniture, call Pak Mail Tampa. Pak Mail Tampa is a full service packing and shipping store as well as a custom crating and freight shipping company. We are located in Tampa and proudly serve the Tampa Bay area and all surrounding cities. Request a Free Online Estimate or call us at 813-910-8044.